Large-scale electronic government projects had mixed results over the past decade. A considerably large percentage of such projects effectively failed. The over-ambitious promise of e-governance positively transforming public sectors in developing nations didn’t fully materialize. The actual causes of e-government failures are still to be explored in more detail to improve the understanding of the phenomenon by practitioners and scholars alike. This chapter explores the causes of e-government failures within the context of Arab states and discusses prevailing views of such failures in earlier literature. Based on a survey of senior e-government practitioners in nine Arab countries, our findings indicate that the underlying roots of failure in e-government projects in Arab countries (which we classify in nine main categories) are entwined with multifaceted social, cultural, organizational, political, economic and technological factors. 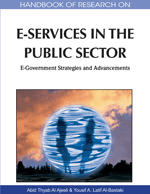 We argue that, despite their many similarities, e-government initiatives in the Arab states would be better equipped for avoiding failure when a local ‘fit’ is established between leadership commitment, sustainable cross-government vision, appropriate planning, rational business strategy, suitable regulatory framework, practical awareness campaigns and rigorous capacity building for the public administrators and society at large. Based on our findings, we argue that replicable “best practices” in a complex and developing field of e-government rarely exist. We conclude with a proposal to nurture a culture more tolerant to risk-taking and failure in the relatively new area of e-government in the Arab states. Until a local maturity level is reached, such culture should be accompanied with home-grown e-government risk management approaches as well as effective mechanisms of knowledge management to enable extracting relevant local lessons from failed projects and partial successes. By the turn of the century, an ever increasing interest in electronic government was building-up globally; a digital government revolution was in the making. The advocates of this revolution were cheering e-government as the panacea; a solution to all public sector predicaments. Most Arab states joined the e-excitement euphoria that swept regional governments. The promise that electronic government (hereafter e-government) initiatives will address public administration dilemmas captured the imaginations of policy makers and attracted citizens and businesses alike. Very few years later and after massive public investments, many of the promises put forward by e-government advocates to obliterate corruption, cut red-tape, reduce government costs and deliver more participatory governance systems have cooled down (Ciborra, 2003). Debates started and the core question was ‘what went wrong?’ e-Government projects failures are not limited to Arab states. They have been documented almost in every region around the globe, see for example: (Akther et al., 2005; AP, 2004; Ciborra & Navarra, 2005; Cloete, 2004; Davenport & Horton, 2004; Eynon & Dutton, 2007; Pardo & Scholl, 2002; Salem, 2007; Titah & Barki, 2006). There is a wide agreement that e-government projects fail in high percentages worldwide. For example, an earlier estimate by UNDESA suggested that more than 60% of e-government projects in developing countries fail (UNDESA, 2003). The World Bank estimate was even more alarming. One lead information specialist at the bank put the percentage of failed e-government projects in developing countries at 85%, from which 35% are total failures (AP, 2004). There is no solid estimate on the percentage of failed e-government projects in the Arab countries, but one could safely argue that the failure ratio had followed the same trend.